Two rotating rotors with flexible fingers are powered by a Honda engine using a simple hydraulic system. Rotor rotation is controlled by the pilot. Wiring to the helicopter is the same as for Fandrich shears although the constant power supply is not used. Fandrich powerrakes are protected by Canadian and United States patents. size - 7 feet in diameter and 6 feet high. Fandrich powerrakes leave tree tops and branches where the environmentalists would like to see them - on the trees, and cones where the silviculturists would like to see them - in the basket. This powerrake, the latest aerial rake developed by Dr. Helmut Fandrich and Kelly Krammer, collects only cones and a few small branches. There is little damage to the cones or to the trees. The Fandrich powerrake hangs from the cargo hook of the helicopter. A control cable from two switches in the helicopter activates hydraulic valves. The Honda engine driving a hydraulic pump runs constantly. When the pilot is over a tree, he switches the rotors on. As he lowers the rake, the rotating rotors strip the cones from the branches and help pull the rake down. The rotors move apart as needed to get over wide branches. When he has reached the desired depth on the tree, the pilot lifts the rake back up. When he is free of the tree, he releases the switch and the rotors stop. Flexible fingers on the rotors deflect around stiff branches. Only when they encounter too many large, inflexible branches do the rotors stall. Rotors start again when the rake is lifted. If he wants additional lift when on a tree, the pilot uses the second switch which causes the rotors to reverse direction and help lift the powerrake back up the tree. The upward rotation should be used sparingly as the fingers are not designed for efficient reverse rotation. 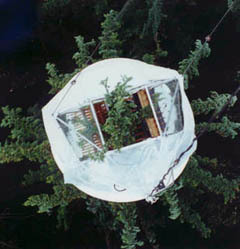 Netting around the fibreglass body traps the cones. When the basket is full, the pilot flies back to the unloading area and hovers while the ground crew pulls two dumping levers, one on each side. 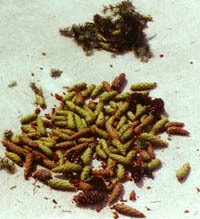 The two baskets open and the cones and debris fall out. The workers then reach in and clean out any caught branches. Finally they slam the baskets closed and the powerrake is ready for another load. 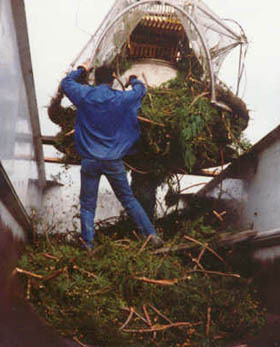 Since the load consists mainly of cones, the pilot gets a large payload per trip and sackers use less time to sack cones. Fandrich powerrakes collect Douglas fir, larch and spruce cones efficiently. "IB#12: Operating Instructions — Fandrich Powerrake" is available in PDF format. To view it, please click here. Click here to download Adobe Acrobat Reader to view PDF files.